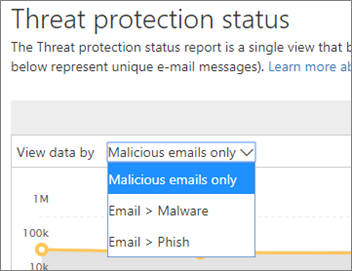 A variety of reports are available in the Security & Compliance Center to help you see how email security features, such as anti-spam, anti-malware, and encryption features in Office 365 are protecting your organization. If you have the necessary permissions, you can view these reports in the Security & Compliance Center by going to Reports > Dashboard. (NEW!) The Encryption report shows information about email messages that were encrypted through policies or by end-user controls. Your organization's security team can use this information to identify patterns and proactively apply or adjust policies for sensitive email messages. To view this report, in the Security & Compliance Center, go to Reports > Dashboard > Encryption report. When the report first opens, you'll see data about encryption methods used on email messages for the past seven (7) days. You can change the date range and details in the report by clicking Filters in the upper right corner of the screen. You can also use the Break down by menu to view data by encryption template (or method). And, you can use the View data by menu to change the view to see counts of encrypted messages to the top five recipient domains. With the flexibility of the new Encryption report, you can view trends and take appropriate actions. For example, if you see a high number of email messages encrypted by users, you might want to add an encryption policy to automate encryption for certain use cases. 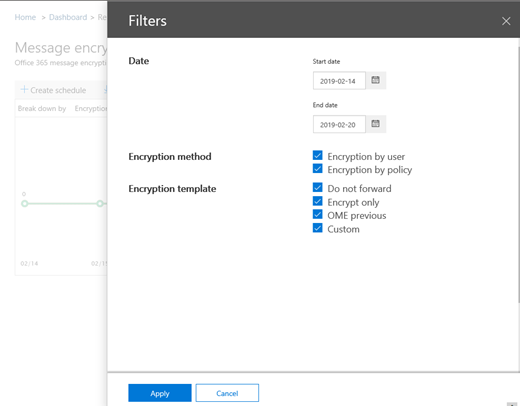 (To get help with that, see Define mail flow rules to encrypt email messages in Office 365.) As another example, if you have a number of encryption templates available but no one is using them, you might explore whether users need training for that feature. 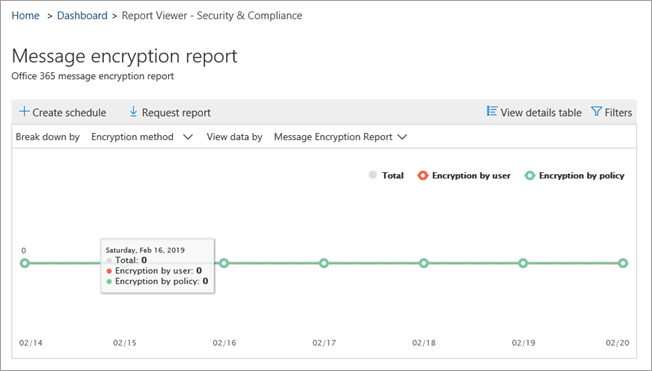 Use this report enables your organization's security and compliance team to monitor how message encryption is being used, and whether further actions are needed. The Threat Protection Status report is a smart report that shows malicious email that was detected and blocked by Exchange Online Protection. This report shows information about email identified as malware or a phishing attempt. 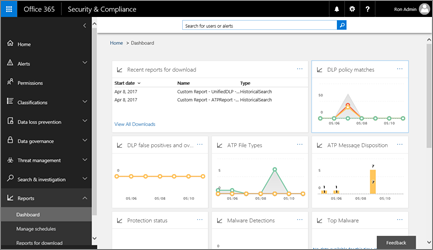 To view this report, in the Security & Compliance Center, go to Reports > Dashboard > Threat Protection Status. When you first open the Threat Protection Status report, the report shows data for the past seven days by default; however, you can click Filters and change the date range for up to 90 days of detail. This report is useful for viewing the effectiveness and impact of your organization's Exchange Online Protection features, and for longer-term trending. You can also choose whether to view data for email identified as malicious, email identified as a phishing attempts, or email identified as containing malware. The Malware Detections report shows how many incoming and outgoing messages were detected as containing malware for your organization. 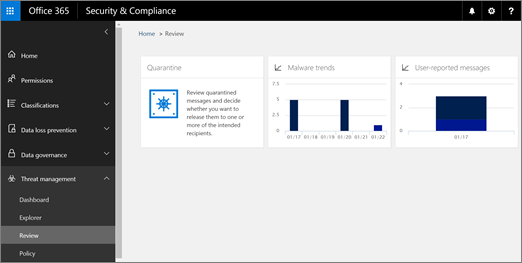 To view this report, in the Security & Compliance Center, go to Reports > Dashboard > Malware Detections. Similar to other reports, like the Threat Protection Status report, the report displays data for the past seven days by default. However, you can choose Filters to change the date range. The Top Malware report shows the various kinds of malware that was detected by Exchange Online. To view this report, in the Security & Compliance Center, go to Reports > Dashboard > Top Malware. 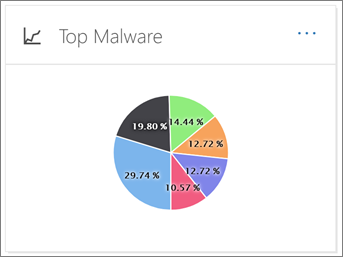 When you hover over a wedge in the pie chart, you can see the name of a kind of malware and how many messages were detected as having that malware. Click (or tap) the report to open it in a new browser window, where you can get a more detailed view of the report. Below the chart, you'll see a list of detected malware and how many messages were detected as having that malware. 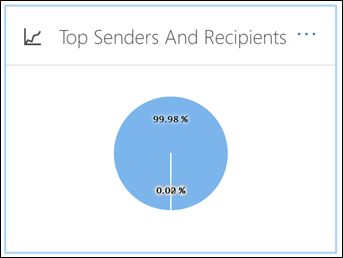 The Top Senders and Recipients report is a pie chart showing your top email senders. 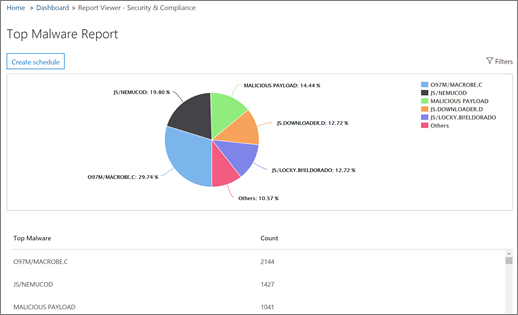 To view this report, in the Security & Compliance Center, go to Reports > Dashboard > Top Senders and Recipients. When you hover over a wedge in the pie chart, you can see a count of messages sent or received. Use the Show data for list to choose whether to view data for top senders, receivers, spam recipients, and malware recipients. You can also see who received malware that was detected by Advanced Threat Protection. Below the chart, you'll see who the top email senders or recipients were, along with a count of messages sent or received for the given time period. 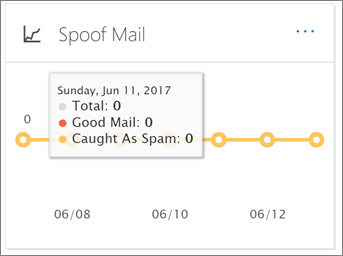 The Spoof Detections report shows how many spoof mail messages were detected, and of those, which ones were considered "good" (spoof mail done for legitimate business reasons). To view this report, in the Security & Compliance Center, go to Reports > Dashboard > Spoof Mail. When you hover over a day in the chart, you can see how many spoof mail messages came through. 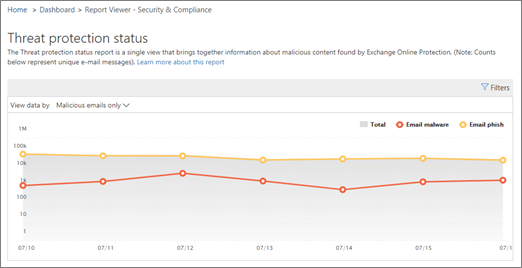 The Spam Detections report shows all the spam content blocked by Exchange Online. 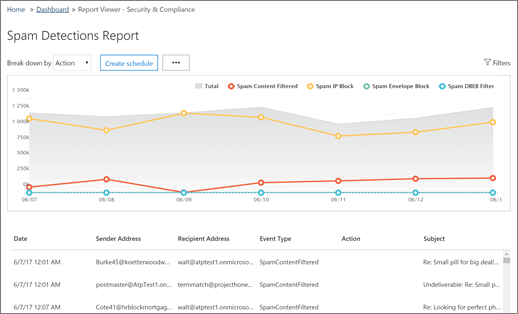 To view this report, in the Security & Compliance Center, go to Reports > Dashboard > Spam Detections. When you hover over a day in the chart, you can see how many items were blocked that day, as well as how those items are categorized. For example, you can see how many spam messages were filtered, and how many items came from a blocked Internet Protocol (IP) address. 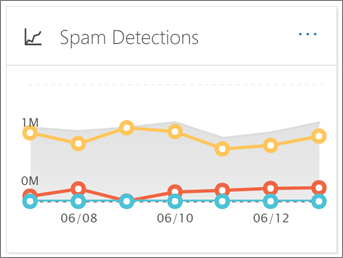 Below the chart, you'll see a list of spam items that were detected. Select an item to view additional information, such as whether the spam item was inbound or outbound, its message ID, and its recipient. 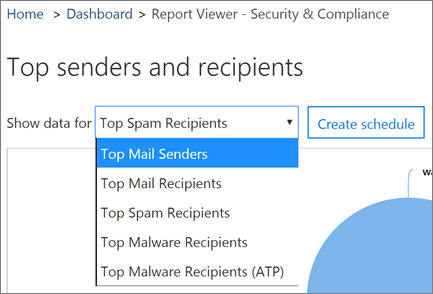 The Sent and received email report is a smart report that shows information about incoming and outgoing email, including spam detections, malware, and email identified as "good." To view this report, in the Security & Compliance Center, go to Reports > Dashboard > Sent and received email. When you hover over a day in the chart, you can see how many messages came in, and how those messages are categorized. For example, you can see how many messages were detected as containing malware, and how many were identified as spam. You can use the Break down by list to view information by type or by direction (incoming and outgoing). 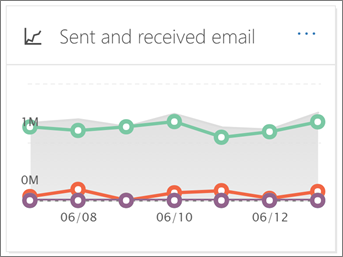 Below the chart, you'll see a list of email categories, such as GoodMail, SpamContentFiltered, and so on. Select a category to view additional information, such as actions that were taken for malware, and whether email was incoming or outgoing. The User-reported messages report shows information about email messages that users have reported as junk, phishing attempts, or good mail by using the Report Message add-in. 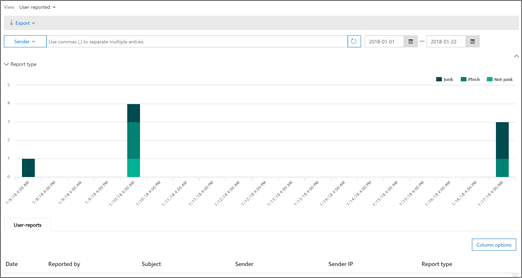 Details are available for each message, including the delivery reason, such a spam policy exception or mail flow rule configured for your organization. To view details, select an item in the user-reports list, and then view the information on the Summary and Details tabs. Go to Threat management > Dashboard > User-reported messages. Go to Threat management > Review > User-reported messages. 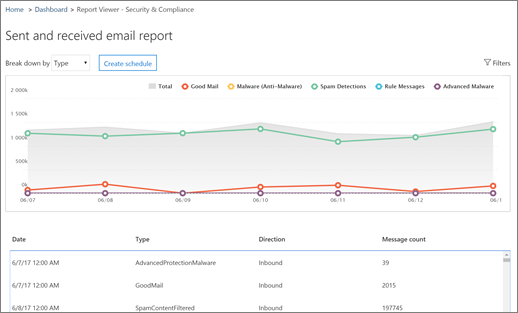 In order for the User-reported messages report to work correctly, audit logging must be turned on for your Office 365 environment. This is typically done by someone who has the Audit Logs role assigned in Exchange Online. For more information, see Turn Office 365 audit log search on or off. What permissions are needed to view these reports? If you are not seeing data in your reports, double-check that your policies are set up correctly. 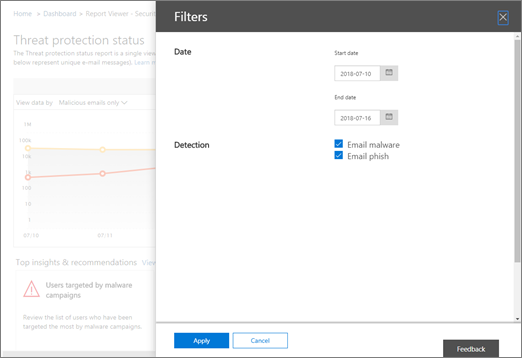 To learn more, see Anti-spam and anti-malware protection in Office 365.